Fountain Systems | Lake Management Inc. 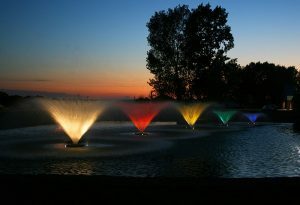 Proudly providing sales and service for Kasco fountain systems. Our fountain systems range from simple to spectacular — with exceptional functionality at every level. These quality, durable units both beautify your body of water with elegant display patterns and provide valuable oxygen and agitation to promote a healthy pond or lake. Each unit is fully contained and includes timers for unit operation. We offer fountain system sales, service and installation, with on-going yearly installation and removal programs. Call 651-433-3283 today for a quote. Circulates oxygen into the water where it is absorbed, increasing aerobic decomposition of sunken organic matter, organic waste and pollutants. Keeps your pond water in compliance with regulatory water quality standards. Eliminates spring and fall turnover. Helps to control mosquito populations. Lake Management offers many options of fountains and aerators to fit your pond or lake needs. Please contact us at 651-433-3283 for a complete unit quote matching your specific site requirements.